Click on the image to view at higher resolution. NGC 6823 is an open cluster of stars surrounded by a large emission nebula designated Sh 2-86 in the Sharpless catalog. The cluster is approximately 50 light-years in diameter. The cluster and nebula lie in the constellation Vulpecula at an estimated distance of about 6,000 light-years from the Earth. The stars in the cluster are very young in astronomical terms and are estimated to be only about 2 million years old. The bright central core of the cluster is composed of large, hot, type O and B class stars. The intense radiation from these stars is responsible for the distinctive shapes of the pillars, Boc globule, and mountainous clouds of the nebula. 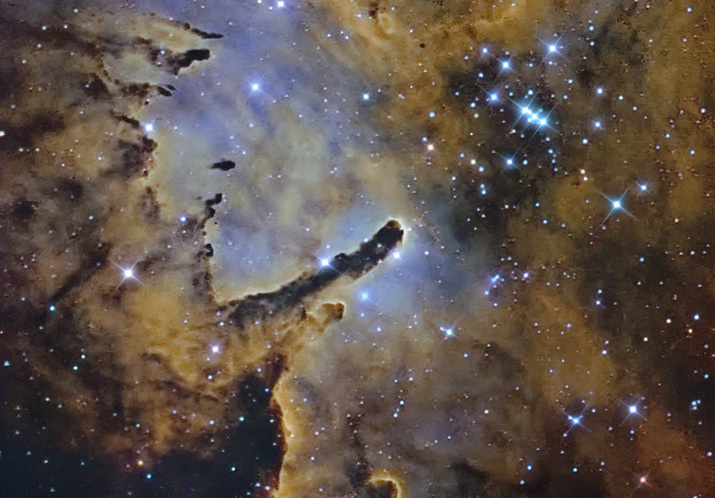 The most striking feature of the nebula is the “elephant trunk” pillar that points to the central part of the cluster. The pillars and other features of the nebula are very similar to the Eagle Nebula made famous by the iconic Hubble image “The Pillars of Creation”. The above false colored image was constructed using narrowband filtered data arranged in the Hubble Palette of SII mapped to Red, Ha mapped to Green, and OIII mapped to Blue. Red, Green, and Blue (RGC) data was used for the stars and overlaid in the image. This image was selected for NASA's Astronomy Picture of the Day.